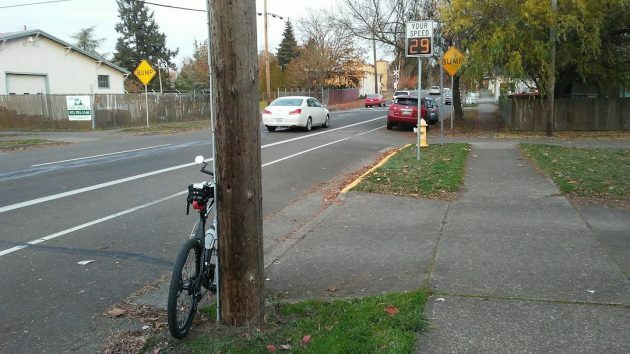 The speed shown on the Second Avenue radar sign at this moment on Nov. 20 was typical. If the experimental radar sign the Albany City Council caused to be installed on Second Avenue has had any effect in slowing traffic, the change is so small it is hard to detect. The sign went up in early June just ahead of where the one-way street crosses the Portland & Western Railroad hump. The speed limit there is 25 mph, and city officials wanted to test whether seeing their speed displayed on the sign would cause drivers to slow down. I went by there last week, leaned the bike against a pole, and watched the display for a few minutes. Just like the last time, in June after the sign went up, most of the readings I saw were below 30 mph. The highest was 32. Ron Irish, Albany’s transportation systems analyst, told me that while no date has been set, he was pretty close to taking a report back to the city council. There have been six speed studies on Second, two from before the sign was installed and four from afterward. Speeding. You have drivers who are considerate of others & keep to the limits. Then there are drivers who fail to plan, fail to allow travel time and just don’t give a damn about others. You could have a few officers out in traffic waving night sticks at drivers to slow down & there would be someone inclined to speed. To be really truthful, all drivers (me to) “speed” now & then. Most change is incremental at best. Any expectation this installation would transform vehicular operation is misguided. What is needed is unmarked squad cars equipped with state of the art radar, piloted by merciless, ticket-writing constabulary. Scofflaws understand only one outcome. Financial pain must be inflicted before speeding dolts get the message. Radar Love!